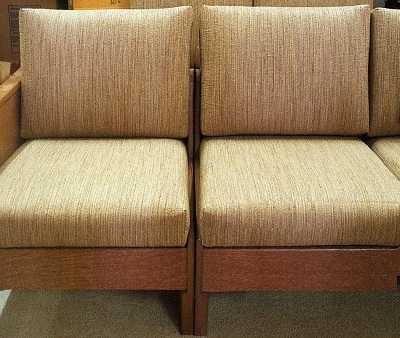 We can make armless sides to go with any of our sofas, loveseats and chairs. The resulting products will be one-arm or armless loveseats, sofas, sectionals and chairs in your choice of many different lengths, heights, thousands of fabrics, and other options. If you want furniture with minimum bulk but maximum seating or lying-down space, this has obvious advantages. An armless wood side extends only 3/4" past the cushioning. Having an armless side might also be preferable if you want to have a table right next to your seat, for a convenient writing surface, or for placement of a laptop computer (perhaps less hazardous to your health than having all the electrical activity right on your lap?). For daybed use, or for stretching out: Our most popular sofa length has six feet of seat cushion length, and we also offer longer lengths. Our various shorter lengths can also be well adapted for these purposes, as follows: (1) You can choose a relatively short sofa or even a long loveseat with one or two armless ends, and a reclining occupant's feet and/or the top of his/her head can extend off the end a bit without significant sacrifice to comfort, or (2) you can even use a shorter armless loveseat (or armless at one end) combined with an ottoman at one end to make a bed of good length. The loveseat/ottoman combination below could work that way. For pricing and lengths, scroll farther down this page. Above: A 56" armless loveseat specially made 3" higher off the floor, combined with a 4"-higher back and extra-firm cushions, with a 27" square ottoman with 440 Series legs, in a tall Delaware customer's home. The fabric is a faux suede in Burch Fabric's Concierge pattern, and the wood has our Medium Fruitwood stain. For this customer, as for some of our other customers who have ordered our armless option, minimization of size while maximizing seating accommodations was an important consideration, for this smallish living room. Notice that these two pieces could create a sleeping surface over 80" long, with just a little moving things around. One important purpose ordinarily served by arms on a sofa or chair with loose cushions is to keep the cushions from shifting around with use. With other armless sofas on the market, this problem might be taken care of by making some or all of the cushioning to be fixed in place. But this means that cushions can't be turned over and rotated, which drastically reduces the expected life of the fabric and filling compared with a sofa with loose cushions. In our construction, we use loose cushions but keep them in place by means of 3/4"-thick solid oak at the sides, with rounded edges coming up sufficiently high to prevent outward shifting during normal uses. The San Fransisco customer who ordered this sectional was very short of space at one end of the sofa but not at the other. NOTE that our seats normally slope backward about 3/4" from front to rear; if you want to level them out for better use as a bed, you can insert towels, newspapers, etc. below the rear half of the cushions, or put a book under each back leg, to serve the same purpose. Also, we can make the seat level in its normal position for $20 extra; but note that this would be with a sacrifice in sitting comfort for most people. This armless sectional is right next to a Chicago-area kitchen, providing a place where the kids can be while Mom is in the kitchen (with little feet sticking off the ends at times, rather than bumping into arms? ), and with just enough room for the whole family on occasions, while taking up only a minimum of space. The sectional above was made 53" x 81", but many other sizes are possible. This size has a base price of $3510, but a 10% discount is allowed off the base price if the customer is willing to wait up to six months. If you see similarities between the sectional sofas shown in this picture and the sectional in the picture just above this one, that's because the family that bought the sofa in the earlier picture apparently liked it, including the fabric, and came back to us three years later to furnish two additional rooms. Notice how well our armless model goes in a sunny room. This Hartford-area customer liked the idea of being able to spread her work out across the armless sofa ends onto adjoining tables (the tables were to be added later). As you can see, our Florida model chairs are completely compatible as part of a matched set together with one of our armless sofas. Or our armless chairs could go with a Florida sofa, or with almost any sofa. Our customer was delighted that we could offer just the perfect fabric for her room. This one is a very moderately-priced, practical one from Robert Allen. With our huge selection, combined with the fact that our customers can provide their own fabric, creating the perfect setting is an everyday thing for our customers. Limited space in their living room was another concern for these customers. With our 33" (standard) frame depth (much less than that of most furniture in stores) and our wide choice of lengths/widths, there was no problem providing furniture that fit perfectly. 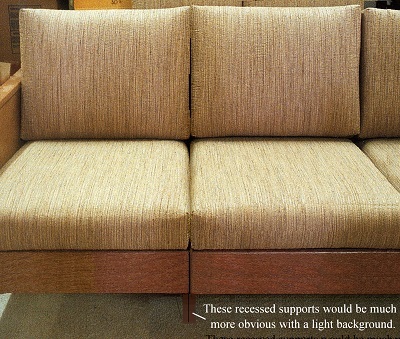 The particular sofa length they chose provides 72" of sitting/reclining length within less than 74" of overall length. 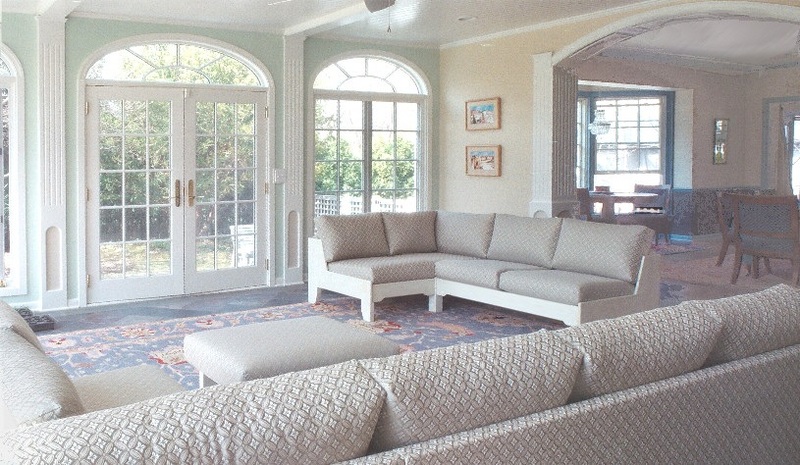 The Florida chairs (partly hidden by their fireplace enclosure) have an ample 24" of seat width within only 28" of overall width, even including arms, since the (wood) arms are non-bulky. We also offer armless chairs. See the prices section near the bottom of this page. Practicality with their several cats was another crucial consideration in this case. In addition to avoiding the upholstered arms that cats typically claw, she also had us apply vinyl inner casings below the covers of the seat cushions. If you have questions and don't care to keep going through this website to seek the answers, please call 1-800-659-0436, leaving a message and a number to call back if we aren't there at the time, or send e-mail to info@comfy1.com . This armless 62" loveseat was made in our 30" depth, painted black, and in one of the many colors in Burch Fabrics' very moderately-priced Ritz pattern. Our customer who ordered this for her New York City residence reported, "The size is perfect: it fits into my room well and 2 or 3 people can sit on it comfortably at one time. I am very pleased with it. ....you can let your customers know that your furniture is great for smaller apartments." If you want an L-shaped arrangement that allows separation of the two sides of the L, and if it can't be against a wall, it is very problematic but possible. There is a special section that deals with that, which you can read if you go the bottom of the page that you get to by clicking here. 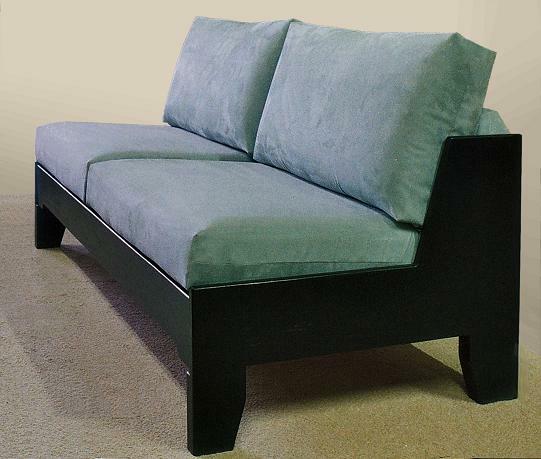 If you want it armless end at one end of a sofa, loveseat or chair, subtract $75 from the price of the regular model. To see the lengths and pricing for the regular models, return to our home page and see the pictures and links for those models. Lengths: When shown on this page, the lengths are the distance from outside of leg to outside of leg. The distance between the wood sides is always 2" less than the dimension quoted. Three-seat sofas: 74" - $2150; .....83" - $2340;........ 92" - $2540. Loveseats: 50" long - $1745;...... 56" - $1855;...... 62" - $1985. Chairs: 26" wide - $1045;..... 29" wide - $1125;...... 32" - $1225;..... 38" - $1405. These prices include 10 to 15 base-priced fabrics, a fabric-covered back, the 31" back height (measured floor to top, shown in all pictures above), and the 33" frame depth. There is a huge selection of high-quality fabrics available within $150 above the base price for a sofa (at $30 per + level), or within $100 above the base price for a loveseat ($20 per + level); fabric for a chair adds $10 per + level. For a 30" frame depth, add a one-time charge of $200 for non-sectional pieces, regardless of how many are in a complete order, or $350 for one or more sectional sofas); for a 36" frame depth, add 25% to basic price. For a webbing suspension, for softer support, add $2 per inch. The back can be covered either with the same fabric as on the cushions or with a matching vinyl, or an all-wood back is available for $4 extra per inch. Toss pillows or arm pillows are $40 per pair, plus $0 - $20 or so for fabric. If you provide your own fabric, the price would be reduced by $40, $30, or $20 for a sofa, loveseat, or chair. Special lengths: Add $90 to the price of the next longer size, or (for extra long) add $350 + $15 per inch to the price of the next longer size. Delivery in the D.C. beltway-Charlottesville-Richmond-Annapolis area would add $100 to $150, packing and shipping to the U.S. west coast would add 22% of the base price, and delivery or shipping to other locations in the contiguous 48 U.S. states and southeastern Canada would be somewhere in between depending on distance from north-central Virginia; for shipments outside the above areas, please call or e-mail for quote, indicating nature of potential order. Special lengths: Add $90 to the price of the next longer length, or (for extra-long) add $350 plus $16 per inch to the longest standard size. Discounts /completion times: Our standard completion time, for orders at the list price, is five to six weeks. * If you can wait as much as six months, we deduct 10% off the base price of the furniture. But, to repeat, our standard completion time is five to six weeks. Since our sales levels fluctuate considerably and unpredictably, we offer discounts to customers who don't expect their furniture soon. This provides a backlog of orders to keep our people working during lulls in sales levels; and it allows easier handling of the full-price orders when we have a surge of them, since worker hours can be diverted from long-term orders at those times. If we don't have surges, the long-term orders come through early, but the customer still gets the full discount. Better advance knowledge of what we'll need to produce also allows us to order supplies better, to hire and train at a moderate pace, and to group our work into efficient batches of similar products. These products will usually be less expensive than ordinary furniture in the long run, especially if they are given heavy use, because they don't wear out like typical furniture. With solid oak at locations where ordinary sofas usually wear out first, and with our wide selection of heavy-duty fabrics (that aren't normally available on residential seating), our furniture will usually look good long after ordinary furniture has become shabby. When our furniture eventually needs new covers or cushions, replacing them is relatively easy and inexpensive. For more details on this subject and on the costs of our small-scale custom manufacturing, click here. To see information about the fabrics that are available on this furniture, click here. (b) with hidden sides, as shown below right. The hidden sides have the disadvantage that they are not of presentable appearance if you separate the two halves of your combination. Also note that the hidden sides have to include supports below, recessed but still noticeable, more or less noticeable depending on the background floor material. Gaps and unevenness between the pieces might be somewhat larger than as shown, since they might be resting on surfaces that are not perfectly flat, or one part might be on a rug while the other part is off the rug.